Portland’s cutthroat rental market is forcing an increasing number of domestic violence survivors to make a tough choice: stay in an abusive relationship or become homeless, according to local advocates who specialize in assisting survivors in crisis. As it becomes more difficult to house domestic violence survivors in Portland’s competitive rental market, advocates said new counseling approaches have emerged. Beier said she’s attended training sessions where advocates learn how to tell survivors there aren’t any shelter beds or housing resources available. One woman seeking services at the YWCA recently told Beier that when she felt the tension building in her home, she’d drive to a remote parking lot and sleep in her car while her partner calmed down. Beier said that previously, she might have used a hotel voucher to keep a roof over the woman’s head while she looked for an apartment, but that isn’t an option anymore because the hotel stay would likely be months long. “My program can’t absorb thousands of dollars in hotel costs,” Beier said. A timeline compiled for Street Roots by Multnomah County’s Domestic Violence Coordination Office shows a parallel between average length of stay at local domestic violence shelters and the increase in fair market rent. 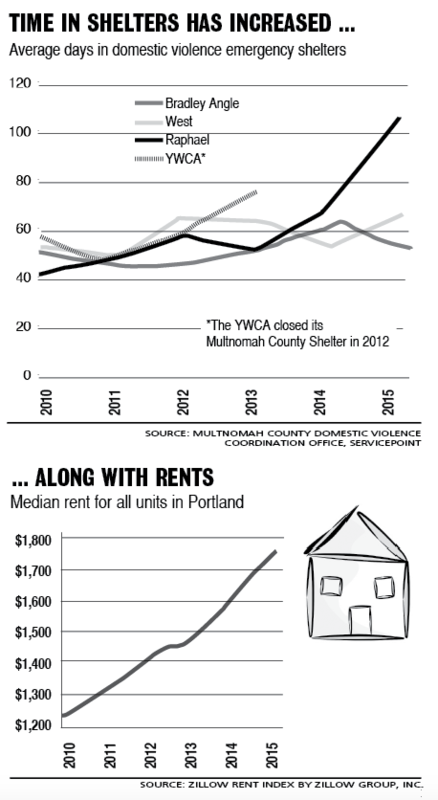 The average length of stay in Multnomah County domestic violence emergency shelters has increased while Portland rents have increased. In fiscal year 2010, the fair market rate of a two-bedroom apartment in Multnomah County, according to the U.S. Department of Housing and Urban Development, was $839 per month, while the average length of stay at a domestic violence shelter was 47 nights. Five years later, that same apartment is valued at $944 per month and the average length of stay at a domestic violence shelter is 70 nights. The fair market value, however, does not reflect the reality of what’s actually available in Portland’s rental market, where rent increased more than 10 percent in the first three quarters of 2015. A query of real estate website Zillow.com for a two-bedroom apartment between $0 and $944 per month – the fair market value according to HUD, yielded only two results, and both were east of Interstate 205. Additionally, Zillow Group Inc. reports the median rental cost in Portland was $1,765 per month in September – $93 more than HUD’s fair market value of a four-bedroom unit, and Zillow was taking every rental unit into account, from studio apartments to large houses. With many survivors looking for housing for not only themselves, but their children as well, the cost of securing an apartment and moving in is easily upward of $2,000.The longer survivors and their children stay in shelters while they try to secure housing they can afford, the longer other survivors have to wait to get in. When the YWCA closed its Multnomah County shelter in 2013 due to lack of funding, the county lost 19 domestic violence shelter beds. Multnomah County has about 10 shelter beds per 100,000 residents while the national average for cities of the same size is 14 to 17 beds per 100,000 residents, said Annie Neal, director at Multnomah County Domestic Violence Coordination Office. She said the county has 33 household units for survivors and their children, with 78 beds spread across those units. In the past several months, stays at the Bradley Angle domestic violence shelter have increased from eight weeks to 12 weeks, said Vanessa Yarie, emergency services manager. “We still continue to get about five to seven shelter requests a day that we cannot meet,” she said, including calls from survivors who are with their abuser and can’t leave because they have nowhere safe to go. Raphael House, another local domestic violence shelter, recently doubled its maximum allowable length of stay from 60 to 120 days “and beyond,” said Christina McGovney, shelter coordinator. “Stays are more like five to six months if there is to be a housing outcome at the end of the stay,” she said. In addition to a shortage of shelter beds, other factors are compounding what advocates are calling an already desperate situation. The Temporary Assistance for Domestic Violence Survivors, or TA-DVS, program provides funds advocates use to purchase plane or bus tickets to get survivors somewhere safe or to make payments to hotels for temporary situations and to landlords for first month’s rent or move-in fees. But Beier said these funds don’t go as far as they once did. The TA-DVS grant allows for $1,200 over 90 days – an amount that hasn’t changed since the program’s inception in 1996. Because this grant became available through Temporary Assistance for Needy Families, it’s available only to survivors who have minor children. Between July 2014 and June 2015, an average of 1,665 families received TA-DVS funds monthly in Oregon. The average case expenditure was $748, according to Oregon Department of Human Services. While the TA-DVS grant is short term, advocates said that even when a survivor has a Housing Choice voucher, which is long-term housing assistance that can be used in the open rental market, it’s still taking much longer for them to find an affordable apartment and landlords willing to rent to them. “I began working for Raphael House five years ago,” McGovney said, “and even up until about two years ago, it was just a matter of getting a housing program to help support families, and there was no real concern about availability and affordability for apartments. Now, even with a housing program, we are seeing families time out of these programs because they cannot find housing in the time frame they are given.” She said it took a woman who recently stayed at Raphael House six months to find an apartment, and when she did, it was far outside her community. Beier concurs that in many cases, the only option for survivors is to uproot from their communities. This could mean moving far away from work, child care, their children’s schools and support outside the home, which can make transportation burdensome. She said many survivors are moving to Vancouver, Wash., and Clackamas County, where they can find housing they can afford. Additionally, in a competitive rental market, domestic violence survivors, whose rental and employment histories are often imperfect – a known side effect of domestic violence – are having trouble competing. For Julie McCurdy, finding housing after leaving an abusive husband proved difficult. “My job history and my credit history were wrecked because of domestic violence,” she said. McCurdy is not alone. A 2012 study by California Law Review found that what it referred to as “coerced debt” affects most domestic violence survivors. Financial abuse can take many forms, from abusers forcing their partners to take out loans to using their checkbooks and credit cards without permission. One survey noted in the study found 84 percent of survivors reported their partner decided when and how they could use their finances, and 68 percent reported they were forced to give their abuser money, their checkbook, ATM card or credit cards. At age 45, McCurdy found herself living on the streets in Portland. Street Roots went with McCurdy, now housed and advocating for survivors’ rights, to a Portland church that provides services to the homeless. Several women shared their stories about how domestic violence has contributed to their lack of stable housing. One woman said she was violently thrown out of her home by an abusive husband 14 years ago. She couldn’t find work or housing and eventually gave up. She’s been homeless ever since. Another woman said she chose the streets, “because I’d rather be alive.” The women said their stories are not unique among Portland’s homeless female population. She also warns survivors not to tell landlords about a TA-DVS grant on the front end because despite anti-discrimination laws put in place to protect survivors receiving assistance, with dozens of tenants to choose from, landlords tend to rent to those with better rental and employment histories. Neal said that countywide, advocates have incorporated apartment application tips into their conversations with survivors. To combat the lack of housing and shelter, she said, other new approaches have emerged as well, such as working with landlords to avoid evictions or add security and using hotel vouchers while clients wait for restraining orders to kick in. She said making landlords aware of their tenants’ rights has helped prevent illegal evictions in some cases. Marc Jolin at A Home for Everyone said that as his organization prepares to make recommendations to the city and county about how to best spend the newly allotted $30 million for shelter space and housing, the growing needs of domestic violence survivors has been a part of the conversation. However, how to spend that money is ultimately up to the City Council and county commissioners. But, Neal said, there’s a “vast difference” between homeless shelters and domestic violence shelters. “Homeless shelters have a long way to improve. They’re very stressful and traumatizing places,” she said. Later this month, she plans to visit several alternative shelter models in Washington that were built following the Building Dignity Strategy. This approach incorporates shelter design and programming focused on healing, empowerment, and meeting the needs of survivors and their children who can benefit from trauma-informed care. Neal said she’s trying to build the case for funding something similar in Portland. A 2003 study of 11 cities and 220 domestic violence homicides found the risk of severe violence and murder is nearly four times greater when a survivor attempts to end an abusive relationship. “Things look different when a domestic violence survivor leaves or becomes homeless because of violence – because there’s somebody out there looking for them,” Neal said, adding that the involvement of child welfare, police and the courts, on top of trying to find or maintain housing and employment, put survivors in a complex and often scary situation. This past legislative session, a bill that would have increased the TA-DVS amount from $1,200 to $2,000 died in the Joint Ways and Means Committee with a $5 million price tag. Senate Bill 503 would have also expanded TA-DVS to include sexual assault victims. Sen. Laurie Monnes Anderson (D-Gresham) introduced the bill and said she will continue to push the issue. She submitted a budget request to Ways and Means to increase the amount to $2,000 before next session. She’s waiting for a response before deciding whether to introduce another bill in the short session but said she will “absolutely” be back with a similar bill in 2017 that will possibly seek a more substantial increase.